A front-page leader in The Economist (28 January, 2017) showcases how in an era of protectionism, global companies are now in retreat. On the other hand, the world has become even more globalized and inter-connected, breeding a new generation of global enterprises and nimble, innovative small-and-medium-sized businesses, thanks to the pervasive internet and its integrated technologies and platforms. China alone now boasts of some 700 million netizens, more than double the entire population of the United States. The number of internet users is similarly rising across the globe, including Latin America and Africa, thanks to the ubiquitous smart phone and supporting networks. According to Klaus Schwab, Founder and Executive Chairman of the World Economic Forum, instead of simple digitization (the Third Industrial Revolution), innovative combination of technologies (the Fourth Industrial Revolution) is upending business models, labor markets, socio-political matrix, and is reshaping our economic, social, cultural, and human environments. A key trend is the development of technology-enabled platforms that combine both demand and supply to disrupt existing industry structures, such as the “sharing” or “on demand” internet economy. The dynamics are multiplied by technology breakthroughs in artificial intelligence, robotics, the Internet of Things, autonomous vehicles, 3-D printing, nanotechnology, biotechnology, materials science, energy storage, and quantum computing. In this topsy-turvy world of the 21st century, understanding internet economics, its complexity and operations, as well as its models, mechanisms and management, would be invaluable to practicing network designers and engineers as well as to industry managers and academic researchers. For them and broader policy formulators, Dr Hans W. Gottinger’s book is a treasure-trove of timely, meticulous research. Readers will find scholarly treatments of a variety of interrelated topics, including internet supply and demand, supply chain analytics, distributed market agencies, Quality of Service (QoS), network modelling and security, aggregated outcomes, output analysis covering financial services, healthcare and legal services, total factor productivity, Big Data, cloud computing, and much more. I have no hesitation in commending Dr Gottinger’s book for all who are interested in exploring the complex, fast-moving, and integrated world of internet economics. From its very early beginning as a project at ARPA (now US. DARPA), the Internet started out as a small scale communication paradigm for a well-established and regulated organization, the military, that over decades, expanded to virtually all dimensions of human life and activity, and seemingly transmitted borderless throughout the world. In substance and impact, it was more than evolutionary telecommunications tools and devices. As economics described the various interactions of human endeavor targeted at social and commercial activities through information and communication, the Internet as a communication system would facilitate and expand economic interaction throughout an ever evolving network economy. 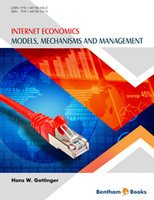 This text makes an attempt to provide an integrated view of internet economics which ranges from modeling internet structures akin to economy-wide modelling, from mechanism design to pricing, cost and service models in view of the changing technology structure of the Internet. From this, a major outcome is to merge networks and economies on a conceptual and practical level and highlight specific application areas such as service provisioning, cloud computing, commerce and business security, network externalities, social media and more recent enlargements to the Internet of Things (IoT), the Industrial Internet, Data Analytics and Big Data. Contentwise we attempt to pursue a middle-of-the-road path in that we don’t shy away from indicating technical issues but embed them in a larger context of relevance to economics and the economy system. We look at the design of the Internet as a reflection of economic mechanisms in universal communication. Resource allocation would involve pricing and cost structures and face network access and regulation. Most approaches of resource allocation mechanism have used a performance model of the resource where the very concept of the resource is defined in terms of measurable qualities of the service such as utilization, throughput, response time (delay) and the like. Optimization of resource allocation is defined in terms of these measurable qualities. The operations research (OR) approach is to design a system which takes into account the diverse quality-of-service (QoS) requirements of users and therefore, uses multi-objective or multi-criteria (utilities)optimization techniques to characterize and compute optimum allocations. Economic (mechanism design) modelling of computer and communication resource sharing uses a uniform paradigm described by two level modelling: QoS requirements as inputs into a performance model that is subject to economic optimization. In the process one transforms QoS requirements of users into a performance (example: queueing service model). This model establishes quantifiable parameterization of resource allocation. For example, average delay QoS requirement, when based on queueing models, is a function of resources, bandwidth and buffer, and user traffic demands. These parameters are then used to establish an economic optimization model. We consider foremost decentralized models of network and server economies , where we show efficient QoS provisioning and Pareto allocation of resources (network and server resources) among agents and suppliers, which are either network routes or servers (content providers). It is shown how prices for resources are set at the suppliers based on the QoS demands from the agents. (i) on a web scale through multi-sided platform interactions, (ii) through the almost limitless expansion of the Internet of Things (IoT) and the Industrial Internet, and (iii) the evolvement of Big Data through volume, velocity and variety and their private, business and public use. The book serves as an introductory, evolutionary account of Internet Economics, from micro to macro. It could be of interest to practicing network designers and engineers as well as to industry and academic researchers. Industrial economists in telecommunications, media and IT services are interested in Internet scale, scope and economics who wish to explore the subject matter further might benefit. The text is also suitable for graduation level courses in operations research, management science, and economics and public affairs programs. Several chapters could serve as supplements to industrial economics, intensive courses on specific topics, as well as complementary texts for mainstream economics or management courses. In what follows, we briefly highlight the contents of the individual chapters. Chapter 1 traces the evolution of the Internet in its historic setting, the emergence of Internet institutions, technologies, architectures and services. From this, an Internet industry was developed with major dominance in the telecommunications world. Some key economic issues involve Internet pricing, Quality of Service (QoS) provisioning, congestion management, Internet regulation and the backbone network technologies such as Asynchronous Transfer Mode (ATM) in view of traffic management and congestion control. The relation between service discipline and the varieties of the bandwidth-buffer tradeoff are discussed. In Chapter 2, we consider the Internet as a market design for information with major actors supplying and demanding information, and supply and demand tending toward equilibrium. Concepts of information flows and delivery provisions would reflect game-theoretic models of trade and exchange economies where the mechanism (design) of information flows would adopt the behavior and outcome of mathematical queueing systems. Of particular interest are large scale systems of the Internet type that act and perform as decentralized distributed systems of multi-level control. A prototype economic optimization model has been put forward for a network economy with variation on traffic classes, utility parameters, queueing types and equilibrium approaches. Chapter 3 considers specific examples of network economies with network routing and transaction processing. Any of these examples capture a structural model of the network economy with Pareto optimality and price equilibrium for agents competing for resources from emerging suppliers. A routing algorithm establishes the dynamic nature of of session arrival and departure. Chapter 4 focusses on economic management of web services in distributed multi-media systems. We dig deeper into mechanism design approaches tracing them back to classical economic mechanisms of market designs and information economics which I refer to as Hayek-Hurwicz mechanism design – due to Austrian-British economist F.A. Hayek and American economist L. Hurwicz. The basic idea of market agents as computationally efficient human agents induced by incentive compatibility and selfishness has been rediscovered and reapplied in rigorous methodological form by computer scientists merging algorithmic game theory, computability and network complexity. Distributed algorithmic mechanism design (DAMD) for internet resource allocation in distributed systems is akin to an equilibrium converging market based economy where selfish agents maximize utility and firms seek to maximize profits and the state keeps an economic order providing basic public goods and public safety. A distributed algorithmic mechanism design thus consists of three components: a feasible strategy space at the network nodes for each agent (or autonomous system), an aggregated outcome function computed by the mechanism and a set of multi-agent prescribed strategies induced by the mechanism. A distributed algorithmic mechanism design being computationally efficient in a large decentralized internet economy is a powerful paradigm to substantiate claims by Hayek (1945) that an industrialized economy based on market principles has an overall better output and growth performance (static and dynamic) than socialist type economies of a similar nature and scale. That puts historically the socialist planning debate in a new light which ironically, by some proposals, has been conducted on the basis of computational feasibility and superiority. Conclusion: Best economic coordination through markets producing maximal social welfare is supported by computational efficiency in computer science. Applications relate to a data management economy. In Chapter 5, we broaden the criteria for QoS performance and guaranteed service through reputation systems hinging on trust and belief, and as the Internet matures in promptness, reliability, accessibility and foremost security for a certain targeted QoS level which we termed as ‘Generalized QoS level’. GQoS should include emphasis on security, reputation and trust. Chapter 6 opens up a new property of Internet enabled communication and computation that is intrinsincally linked to the interactive social and commercial use of websites through the World Wide Web (WWW), i.e. two-sided or multi-sided platforms. We provide a model of platform operations that involves a sequential decision process very much alike a dynamic programming algorithm (DPA) for selecting functionalities of the platform. This serves as a simple approximation procedure for building the optimal design of a platform. The platform business in a vertically integrated supply chain as well as toward product development is a good example of facilitating ‘increasing returns mechanisms’ (IRM), as one can follow the evolution of the Amazon platform in a commercial context but also on the growth of social media like Facebook and LinkedIn. Such a business growth would not have been facilitated without a dedicated, universal, easily accessible and low cost network economy provided by the Internet. Chapter 7 shows how the Internet could lead to a radical expansion to the Internet of Things (IoT) with everything being connected up to a scale of aggregate capacity and complexity. It could evolve into a network where not only each node would be a computational device but by itself, it would also be an intelligent computing device that could replace human supervision and control through Artificial Intelligence (AI). The Internet of Things (IoT) as being embedded in the ‘Industrial Internet’ is a new paradigm shift that comprehensively affects computers and networking technology. This is also recently referred to the buzzword ‘Industry 4.0’. This technology is going to increase the utilization followed by Bandwidth of the Internet. More and more (intelligent) devices in this network are connected to the Internet through various combinations of sensor networks. Chapter 8 focusses on huge online data generation through an expanded Internet (IoT and the Industrial Internet) and using the flux of information for monitoring, predicting, controlling and decision making. During the time of applying methods of statistical inference and statistical decisions some 70 years ago, information derived from data collection was considered costly. Models were built where information was linked to payoff relevance of a decision making criterion (utility or payoff function), therefore statistical information was handled to satisfy these criteria. Now as masses of online data through IoT are produced at relatively low costs, all these data could be quickly aggregated for business or government decisions. Statisticians have coined a term, ‘value of perfect information’, which was set up to integrate data points, collection and analysis through statistical inferential models i.e.,exploratory data analysis (EDA) or through statistical decision models . For example, achieving this goal is quite challenging to gather all the data for perfect information. What really is subsumed under ‘Big Data’ (BD) qualifies under a few main characteristics: (i) BD is primarily network generated on a large scale by volume, variety and velocity and comprises large amounts of information at the enterprise and public level, in the categories of terabytes (1012 bytes), petabytes (1015) and beyond of online data. (ii) BD consists of a variety and diversity of data types and formats, many of them dynamic, unstructured or semi-structured and are hard to handle by conventional statistical methods. (iii) BD is generated by disparate sources as in interactive application through IoT from wireless devices, sensors, streaming communication generated by machine-to-machine interactions. The traditional way of formatting information from transactional systems to make them available for ‘statistical processing’ does not work in a situation where data are in huge volumes from diverse sources, and where even the formats could be changed. While Internet economic effects in micro structures, that is, on enterprise and industry levels, have been our prevailing concern in previous chapters, Chapter 9 addresses network effects on a macro scale involving productivity, growth, and the business cycle. The network effect is strongly facilitated by computerization and information technologies (ITs). Ubiquitous computerization pervades many sectors of the economy, and communication by network technologies such as the Internet (the network is the computer) is a strong catalyst. Eventually, through this synergy, most sectors of the economy will be impacted by network effects. Thus, networking and computerization have far-reaching impacts on the pace and path of the economy but they could also make the economy more vulnerable to economic shocks and security breaches. We address three important issues: Networks and productivity, endogeneous growth and increasing returns. Examples of some productivity- enhancing activities on the enterprise level which aggregates to impacting total factor productivity on a macro scale are (i) comput-erization of ordering along the supply chain, (ii) Internet-based procurement systems , and (iii) computer-based supply chain integration. There are many other examples of pervasive internet applications that trickle down to aggregate increases in productivity. The relationship between technology and productivity used for the United States, on the economy or sector level, found little evidence of a relationship in the 1980s. Capital investment between 1977 and 1989 rose several hundred per cent but was barely reflected in a rise in output per worker. There was this famous saying by Nobel prize-winning economist Robert Solow (1987): “You can see the computer age everywhere except in productivity statistics”. In the 1990s, such a positive relationship on the firm level was established empirically. On a short-term basis: one-year difference in IT investments vs. a one-year difference in firm productivity should be benchmarked by benefits equal to costs. However, benefits are supposed to rise by a factor of 2–8 in forecasting future benefits (in productivity growth). Economic techniques focus on the relatively observable aspects of investment, such as price and quantity of computer hardware in the economy, but neglect intangible investments in developing complementary new products, services, markets, and business processes. The recent World Bank World Development Report (2016,) clearly states for the macro economy as three key factors of growth: (i) Inclusion – through international trade, (ii) efficiency – through capital utilization and (iii) innovation through competition. Current statistics typically treat the accumulation of intangible capital assets, new production systems, and new skills as expenses rather than as investments. This leads to lower levels of measured outputs in the periods of net capital accumulation. Output statistics miss many of the gains of IT brought to consumers such as variety, speed, and convenience. For instance, US productivity figures do not take account quality changes, in particular, in services industries: (a) financial services sectors, (b) health care, and (c) legal services (online information). As a time-dimensional cross-sectional review and synthesis of Internet economic and technological issues, this text naturally covers some overlapping areas , in particular, in Chapters 1 to 5. It also serves the purpose to make each chapter self-contained and self-serving on the development of the topics. The material in the book is for the most part the product of multi-year efforts on working and consulting network economies and innovation processes. In preparing the previous text ‘Networks, Competition, Innovation and Industrial Growth’, New York: NovaScience (2016), I was made to believe that network economics in terms of Internet Economics reveals some unique features of combining networks with technological change. From economic point of view, it is amazing how many positive network externalities are connected with the Internet but also with its growth and ubiquitness how many dark sides (negative network externalities) are proliferating so that one ultimately talks about high level of regulations in response to a potential cyber war against people, corporations and nations. Contrary to a widespread belief of economics as a dismal science, we tend to emphasize the positive aspects of Internet Economics though we do not deny some dark aspects with the implicit assumption that the net economic effect in most cases is positive. 1.“Network Economics for the Internet – Application Models”, iBusiness 3, 2011,313-322. 2.“Network Economies for the Internet”, Modern Economy 3, 2012, 408-423. 3.“Quality of Service on Queueing Networks for the Internet”, iBusiness 5, 2013, 1-12. 4.“Internet Economics of Distributed Systems”, Transactions on Networks and Communication 2(6), 2014, 56-72. 5.“Supply-Chain Coopetition”, International Journal of Business and Economics Research 4(2), 2015, 67-71. 6.“Vertical Competition and Outsourcing in a Supply Chain”, International Journal of Business and Economics Research 4(6), 2015, 315-322. 7.“Krohn-Rhodes Complexity on Decision Rules”, Advances in Social Sciences Research Journal 3(4), 2016, 30-43. I want to specially mention and thank Prof. Stanley Reiter (Northwestern Univ., Evanston) on conversations regarding his work on Computation and Complexity, and the late Professor Leonid Hurwicz (Univ. of Minnesota) on economic mechanism design that relates to Chaps. 2-5. Also the insights of Prof. B. Vöcking, RWTH Aachen helped me to advance on applications to algorithmic game theory. Chap. 8 has been joint work with Dr. Soraya Sedkaoui at Montpellier University. The figures associated with Chaps. 2 and 3 have been provided by Mrs. Sabine Spiesz of Spiesz Design, Neu-Ulm. My special thanks to all of them. The author offers, in this book, several self-contained essays around two broad themes: Economic analysis, which has the potential to improve internet provision and services, and the development of internet, which has contributed much and will contribute even more to real economies. To do so, he expertly links standard economic concepts and models with the peculiarities of the internet, such as its specific technological constraints, its network structure, its pervasive economies of scale, interdependencies and external effects, its size and complexity, and the immense amount of data it generates. The reflection touches upon computer science, operations research, and artificial intelligence. The choice of topics and real-life examples is wide and convincing, the perspective definitively optimistic. But little quantitative evidence is provided to support the book’s claims. Following a broad introduction to distributed data transmission and the raise of internet, several chapters are dedicated to the use of market mechanisms for resource allocation in distributed communication systems, efficient provision of a high quality of service, and the pricing of internet services. Diverse mathematical models are suggested. Further chapters are dedicated to e-commerce, social media, and platform design, to the Internet of Things, and to the generation and use of Big Data. In the last chapter, Gottinger addresses macroeconomic impacts such as the link between the spread of internet and growth, and most particularly the vexing question: Why do official statistics indicate that the digitalization of the economy has a very small impact on growth, although it profoundly affects our professional and professional life? The author’s privileged answer is the mismeasurement hypothesis, which says that the discrepancy between perceived and measured contribution stems mostly from a statistical underestimation of the induced quality improvements and perhaps from a neglect of fundamentally new impacts. Why these factors are without a doubt real and important, the current wisdom is that they do not explain much of the productivity puzzle. However, the same current wisdom also states that we still do really comprehend the current and future impacts of internet. The author's vision may well prove to be the right one. Gottinger’s Internet Economics offers not only a wealth of pertinent information and promising approaches, but also a rich foundation for further reflection and the motivation for numerous Ph.D. theses. It includes a most useful guide to the main abbreviations and a glossary of the main concepts. The list of references is relatively, short, with a dearth of recent titles. This is no longer a serious shortcoming as it can nowadays easily be remedied through an Internet search – an ultimate example of the benefits of digitalization asserted by the author.